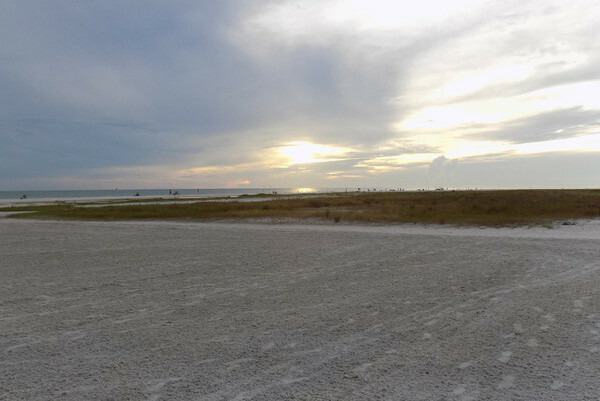 Siesta key ‘public’ beach is great for weddings… but we already know that! Siesta key public beach is beautiful. It was ranked as the nations #1 beach for 2011 and is consistently ranked as one of America’s most beautiful beaches. So, it’s not a surprise that many brides & grooms arrive here just to be married on Siesta key public beach. With its’ powder white sand and wide open space for beach weddings that can handle over 100 guests easily and yet never be bothered by the everyday beach-goer. There’s also a few stunning, ‘off-the-beaten-path’ wedding spots – if you know where to go. Here’s what wedding couples need to know about those hidden ‘secret ceremony spots’ on Siesta key. One of my Favorite Secret beach wedding spots on Siesta key. My couple wanted the Tiki Beach Wedding Package, with a sunset ceremony. First kiss pictured. 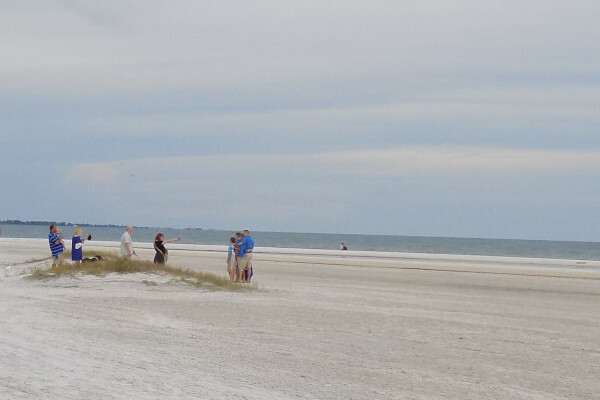 These secret Siesta beach locations are best for groups of 20 or less who don’t mind standing during the wedding ceremony. No chairs allowed. No bamboo arch’s allowed. 4 Tiki torches are just about right, and the Sand Ceremony is very cool too! Don’t forget to BYOM, Bring Your Own Music, it’s easy. We have wonderful photographers to capture all those amazing once in a lifetime moments. Never forget…. It’s all about the photo’s. Just ask us about our photography options and our really affordable pricing. Were not kidding, it’s really affordable! Secret Siesta key beach wedding spot. Pictured: Photographer taking photos of newlyweds and family. And if your planning on having your wedding or vow renewal or maybe even having your elopement here on Siesta key please take a few minutes to look at our post, ( with tons of pictures ) all about Siesta key village including possible restaurant reception ideas. Very nice.